Hebrew and Yiddish commemorative plaques, statues and busts, an active synagogue, stumbling blocks to remember those who died – when walking down the streets of Vilnius, one cannot escape the city’s Jewish history. Until the beginning of the Nazi occupation in 1941, the so-called Litvaks, Lithuanian Jews, constituted between 30 and 40 percent of the city’s inhabitants. Wilne, as it was called by its Jewish population, was the biggest Jewish city of the time. In the 18th century it was known as a religious centre and even called the “Jerusalem of the North”, despite anti-Semitism and anti-Jewish attacks. While little is left of the old Wilne, given the Soviets never rebuilt what was destroyed by the Nazis, one can still follow the footprints of the extinguished Jewish community, which can be found all over the city. Vilnius in Lithuanian, Wilne in Litvak, Wilno in Polish and Wilna in Belarusian – the city deserves a walk along its ethnic paths. The starting point is Vilnius Town Hall, in the middle of Didžioji gatvė, a broad central street in the southern part of the Old Town. 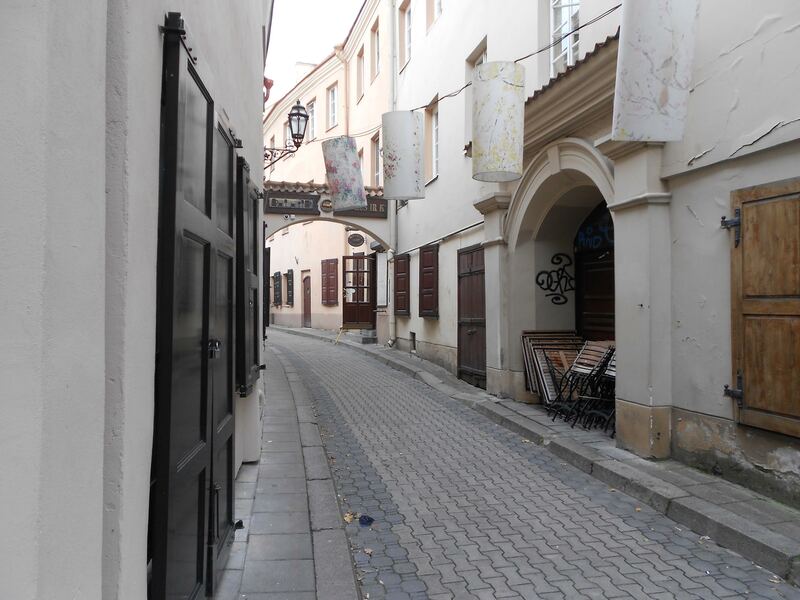 Jews were forbidden to trade there, but they could on Vokiečių gatvė (German Street), just a few metres away. The street got its name from its German craftsmen and traders and soon became a lively centre of Jewish and German culture. The Litvaks, as the Jews from the Polish-Lithuanian Commonwealth referred to themselves, were regarded as highly cultured and erudite. One of their sayings was: “To gain money, go to Łódź; to gain knowledge, go to Wilne.” They mainly lived in a self-governed quarter near Vokiečių gatvė, also called the “black quarter”. The origins of the name have been contested: some argue that it comes from the black clothes of Orthodox Jews, others say it recalls the bad hygienic situation in the quarter. Anti-Semitic prejudices were still alive in the 19th century – such as the story that Jews baked their bread with the blood of Christian children. Nowadays, this part of the city is the touristic centre with its cobblestones, narrow alleys, low houses and arrows over the streets. The arrows served not just as supporting structures for the buildings on both sides of the street, but also as emergency exits in case of fire. Near broad Vokiečių gatvė, accessible through a small path between two tall apartment buildings, there is Žydų gatvė (Jewish Street). Remigijus Šimašius, the liberal mayor of Vilnius, recently unveiled a new street sign in Hebrew and Yiddish to emphasise the historical diversity of the city. The same happened with Rusų gatvė in Russian, Varšuvos gatvė [Warsaw Street] in Polish and even Totorių gatvė in Tartar. However, the project did not only evoke positive feelings – within a few hours of its unveiling, the sign of Rusų gatvė had been painted over by nationalists. The one in Žydų gatvė is still intact but its future is uncertain: a local politician announced they will challenge the project in court, as according to Lithuanian law, official place names have to be written in Lithuanian. If the charge is successful, the sign in Žydų gatvė will have to be removed. Not far from the place in Žydų gatvė where the Great Synagogue of Vilnius was once located, under birch trees and weeping willows, an attentive visitor can see a bust of the Gaon of Vilne, Elijahu, a representative of the 18th century’s Orthodox Jewry. Many myths developed about his wisdom: it is said that he read the Torah when he was five years old and interpreted it at the age of seven. He slept for four hours a day at most and put his feet into cold water during his studies in order to not to fall asleep during the day. On the occasion of the 200th anniversary of his death in 1997, the bust was renovated. The original was never found, but there are a few legends about the circumstances of its creation. According to one, it was supposed to be made by an arts student out of the image of Karl Marx. Another anecdote claims that the Lithuanian artist did not know about the prohibition of showing faces in Orthodox Judaism and the bearded bust remained in his basement for several years. To protect it from the anti-religious Soviets, he passed it off as a bust of Karl Marx. In Žydų gatvė there was a big library that belonged to the Great Synagogue. According to different sources it used to contain more than 35,000 books and that 5,000 people could fit inside the Synagogue itself. In 1812 even Napoleon described it as being as magnificent as the French cathedral of Notre Dame. Unfortunately, the Great Synagogue and the library were destroyed during the Second World War, partly by the Nazis and partly by the Soviets when they reoccupied Lithuania in 1944. Today a school is located there. Since 1990 the Jewish community of Vilnius have been demanding the Great Synagogue be rebuilt, yet only superficial promises have been made and no concrete steps have been taken so far. Perhaps this is due to the fact that Lithuania and Lithuanians have not yet confronted their role in the Shoah, the Holocaust. To sum it up in numbers, out of a former 100 houses of worship there remained just one synagogue, which was used as a warehouse by the Nazis. Out of more than 60,000 Jews who used to live in Vilnius, only 2,000 survived the three years of German occupation. Immediately after the beginning of the Nazi occupation in 1941, Jews were placed in the city’s two ghettos. In the smaller one, located at the east of Vokiečių gatvė, lived 11,000 people – mainly the elderly and those who were unable to work. After two months, the Nazis and their Lithuanian collaborators brought them to the small village of Paneriai outside Vilnius and shot them there. The big ghetto was at the west of Vokiečių gatvė and lasted until autumn of 1943. The Judenrat had its headquarters there; there was a library and a well-attended theatre, which was visited even by the occupying forces. For the actors it was an important advantage – thanks to the theatre, they were not classified as “unfit for work” and were not moved to the small ghetto. In 1943 the big ghetto was dissolved as well and the imprisoned Jews were either shot in Paneriai [a suburb of Vilnius] or deported to labour camps in Estonia. The Austrian Gedenkdienst organisation, which established the online “Holocaust Atlas of Lithuania” project in 2010, calculated the number of Jewish victims as 70,000 in Paneriai alone. If other victims – mainly Russians, Poles, Roma and communists – are included, the number rises to about 100,000. Between 1941 and 1943 the Polish journalist Kaziemierz Sakowicz, who lived near Paneriai, wrote about the mass shootings in his diary. He worked for a Polish newspaper in Vilnius and was part of the Polish Home Army that fought against the Nazi occupation. He was shot in 1944 by unknown Lithuanians and the circumstances surrounding his death were never fully discovered. His diary explains the daily horror of Paneriai forest: the deportations, torture and shootings lasting whole days. On certain days he would make only short notes of the number of people killed. The diary, written on loose sheets, placed into lemonade bottles and buried in the ground, was dug up by Sakowicz’s neighbour and handed over to the Jewish Museum of Vilnius, where it remained without proper attention being paid to it until 1998. It was published in Polish in 1999, in German in 2003 and in English in 2005. The Lithuanian edition was finally published in 2013, on the occasion of the International Holocaust Remembrance Day on January 27th. When the Red Army approached the territory of Lithuania in 1944, the Nazis and their local collaborators tried to destroy the traces of their crimes. They forced 80 of the last surviving Jews to exhume the corpses of their kinsmen and burn them. However, the group of Jews did not believe they would spare them in the end, and during the works they managed to dig a tunnel to safety and freedom with their own hands. On April 15th 1944 they tried to escape. Eleven of them survived and were able to join the partisans in the Lithuanian forests. The story about the Paneriai tunnel was well-known over the years, but it was not found until the summer of 2016. An international team of archaeologists from Canada, the United States, Lithuania and Israel discovered the tunnel and the ashes of about 7,000 corpses nearby. The case is now administered by the Vilna Gaon Jewish State Museum. Today, this chapter of the city’s history seems to have been memorialised only by a handful of small initiatives and not in a broader, systematic way. In front of the former building of the Judenrat in Rūdninkų gatvė, for example, there is a stumbling block that commemorates Icchokas Rudaševski, born in 1927, imprisoned in the ghetto in 1941 and shot in Paneriai in 1943. Through his well-maintained diary the young man became the chronicler of the ghetto of Wilne. Besides busts, statues, stumbling blocks and remembrance plaques, very little of the former “Jerusalem of the North” has survived in modern Vilnius. The formerly highly diverse city is much more homogeneous today. In 1900, Vilnius was not only the biggest Jewish city, but also the centre of the Belarusian national movement, and it was exposed to strong Polish influence as well. Only two per cent of inhabitants at the time were ethnic Lithuanians. Today, their share of the total city population is higher than 60 per cent; twenty per cent are Poles, but the Jewish community in Vilnius – as in the whole of Lithuania – nearly vanished. Many of those who survived emigrated to Israel or the United States. Those who stayed still pursue the reconstruction of the Great Synagogue at its former site. Primarily, however, it is the Jewish community that demands proper remembrance politics and, in this way, contributes to Lithuania’s important public confrontation with its own history. Marita Gasteiger is a graduate student of Interdisciplinary Eastern European Studies at the University of Vienna. After several study visits to Minsk and Moscow, she is currently doing an abroad semester at Vilnius University. Gasteiger works as a freelance journalist for the Austrian Augustin street magazine and has been politically active in the Austrian Students’ Union.